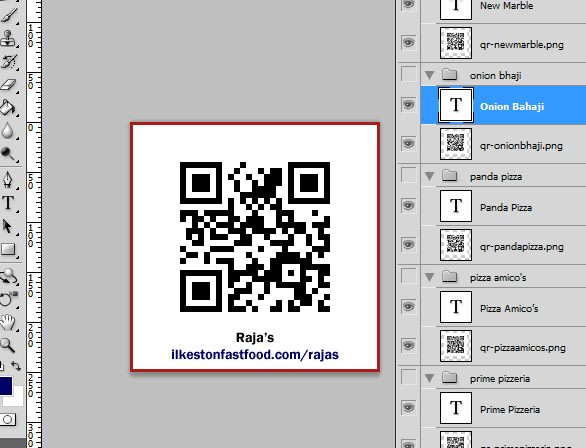 Here is a low cost method for experimenting with printed weather proof QR codes to promote a local product or service on a website. The following labels, stickers and banners can be produced at minimal cost before committing to a professional print run. 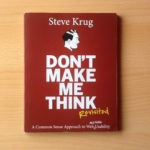 By gathering the materials at low cost (or even free if you beg or borrow) it is possible to raise awareness of and funnel people to a website landing page. To actually generate the Quick read (QR) barcodes, search online for a high quality QR code generator website and punch in your webpage URL. 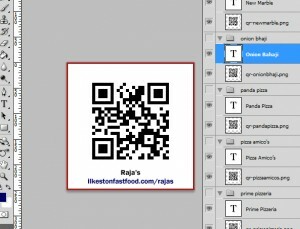 You can read about how I generated these codes for local fast food businesses. In my example, they have been produced with monetisation and website traffic building in mind. The QR codes are designed with references to online payment systems, and because I needed to be able to track how many people are scanning the codes with their mobile device QR reader I set up Google Analytics tracking using the GA URL builders. It is strongly recommended you do this. My logic in advertising via a print medium is to capture more potential users of the site who may not be aware of its existence. I once worked in a factory that made warehouse labeling systems, where we manufactured laminated sticky banners bearing stock control data. I was able to save large off-cuts for personal projects. 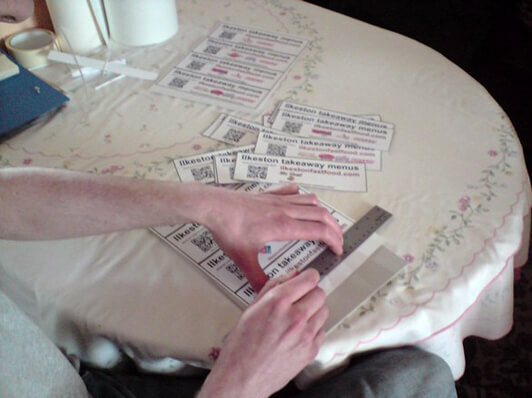 Several years later these same manufacturing techniques are serving my own promo experiments with QR codes. The stickers/labels you produce need to be damp/condensation proof otherwise the ink can bleed. 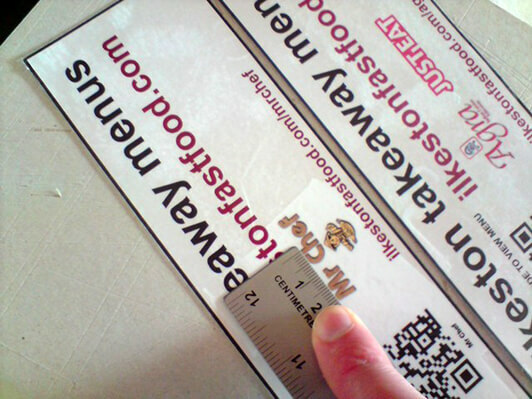 The laminated surface protects the QR code from becoming damaged. 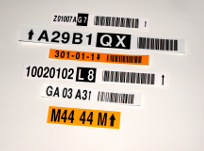 The necessary supplies are things like laminating film and double sided self adhesive which . 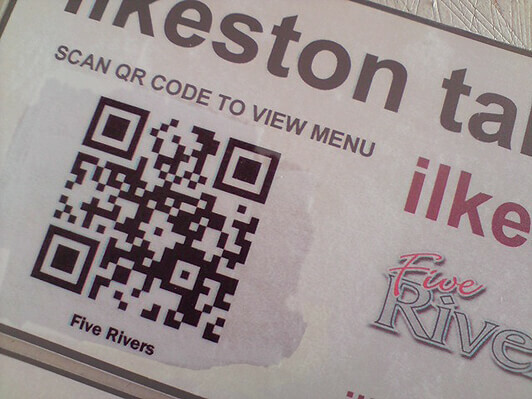 In the event of the QR barcode becoming defaced, it will still actually work to a certain point. 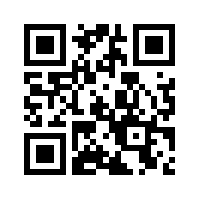 Read about QR error correction here. 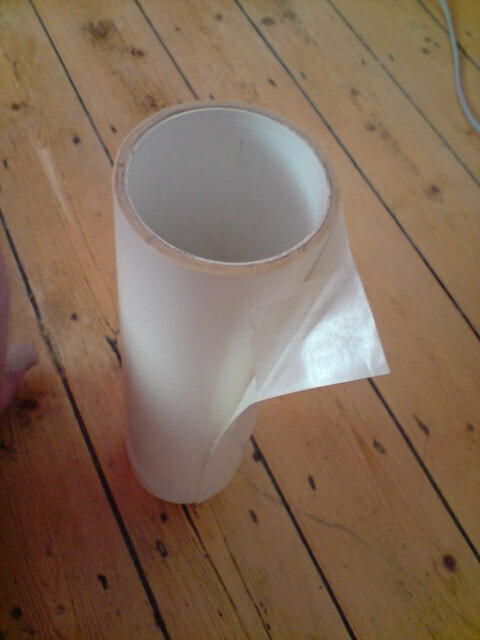 In the image below the left roll is double sided self adhesive and the right roll is single sided clear laminating film. You can purchase the required items online at low cost. Otherwise use some initiative by looking to alternate methods like a laminating machine in a local library or whatever is available. 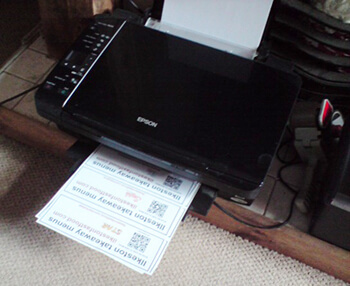 If it’s a small niche or test market you’re designing QR barcodes for, an inkjet printer set to high quality with decent photo paper is adequate for printing. Just be sure to laminate if they’re going outdoors or on cold windows. I used Adobe Photoshop for laying out test designs. Gimp has similar capabilities to Photoshop and is free. Paint.net is also free and has similar functionality to Photoshop. Assuming you have Adobe Photoshop, do yourself a favour and download Adobe Bridge too. Bridge allows you to import multiple images as multiple layers to a single Photoshop document. 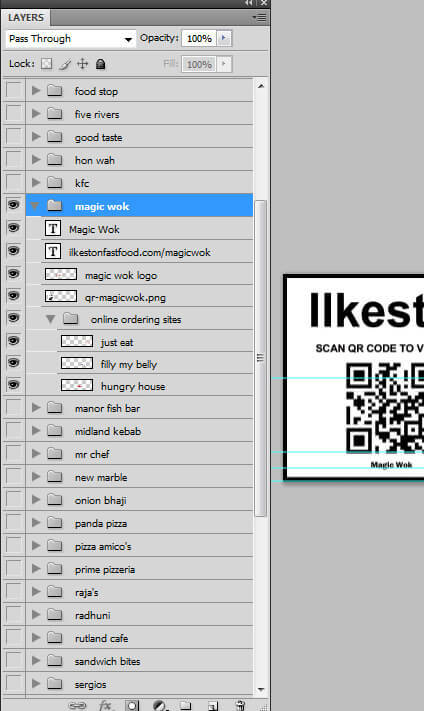 As you can see from the screenshot below, I selected all my QR codes (first copied to a single folder) and clicked “Tools”, scrolled down to “Photoshop” and selected “Load files in Photoshop Layers”. Adobe Bridge is useful for loading lots of images into a single Photoshop .PSD file too. Similarly, Photoshop layers can be sent to other open Photoshop files. Right click the layer you want to export and click the blue arrow under “Destination”. Choose the .PSD document you want to copy your layer over to and hit OK.
What I like about this send layer feature is the ability to send those layers to specific groups in the other open .PSD document. Before sending layers elsewhere, first select the chosen group in the other .PSD document. Name each group and layer too. This helps you stay properly organised. Also, organise ALL your layers into groups and sub groups. These things become messy without a hierarchy so do something you’ll thank yourself for later. The example left shows my groups, layers and subgroups. It took a while to arrange each single relevant logo for every takeaway business, but this only needs to be done once. In future it is a matter of updating the files and layers should anything change, for example, an affiliation between the business and the online ordering websites. 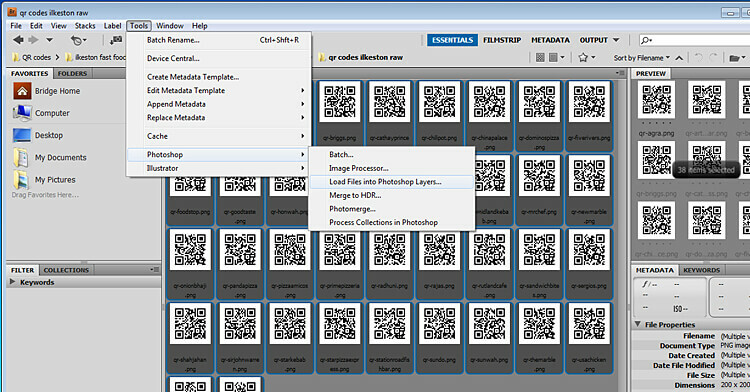 Each Photoshop layer group contains the appropriate QR code, text, business logo and online ordering logo. It took a long time to customise each sticker banner, but it is worth doing this correctly first time. A ruler and sharp knife will be needed. A small guillotine or trimmer is an alternative. Cut out each banner with care. In the photo below I was leaning on thick 1 ply cardboard. A self healing cutting mat is better. If you can get your hands on transparent laminating film, like that shown below, great. You’ll need to trim it into sections. Mark roughly where the cut needs to be made. Measure enough to leave enough a margin for error. The photo below is a rough indicator of what you must do. 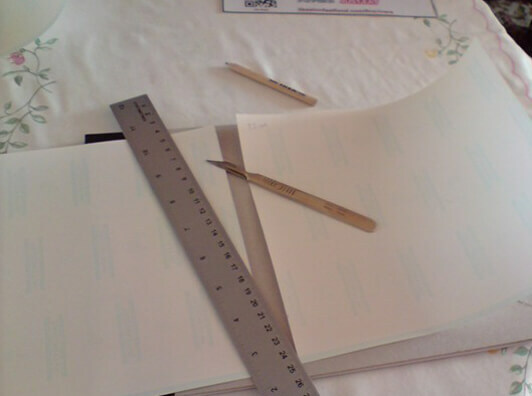 Cut the laminating material with a knife or scissors. 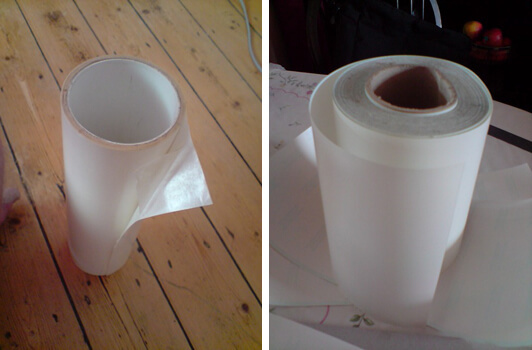 Peel the backing paper away from the laminating film. Don’t let any dust or debris get onto the sticky surface. 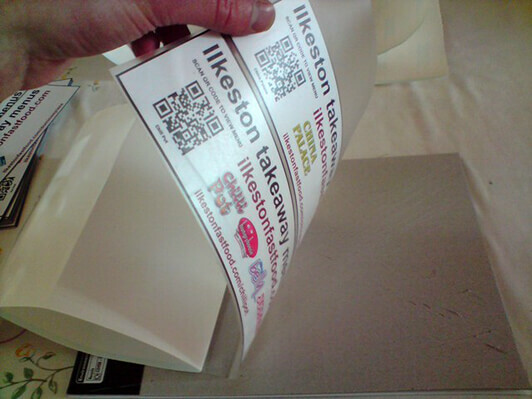 Carefully lay each of your paper/card labels face down onto the sticky side of the laminating film. Do it whichever way suits you or feels most comfortable. Apply appropriate smooth pressure. Below I am laying the paper label on to the sticky surface of the plastic film. 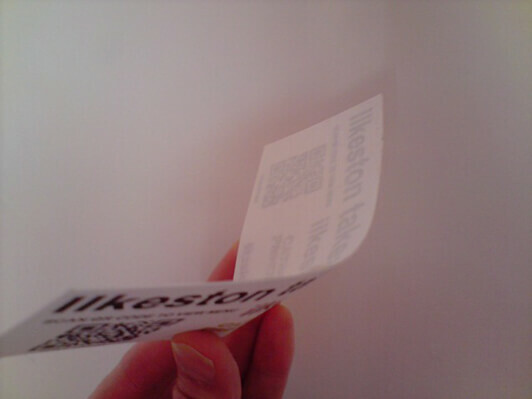 The sticky plastic film protects the front of the sticker from wear and tear. Slice off excess plastic with a good sharp blade. Smoothing bubbles by applying pressure with a flat object is always necessary. The factory I worked in had a mechanised set of rollers operated by a foot pedal performing this function. 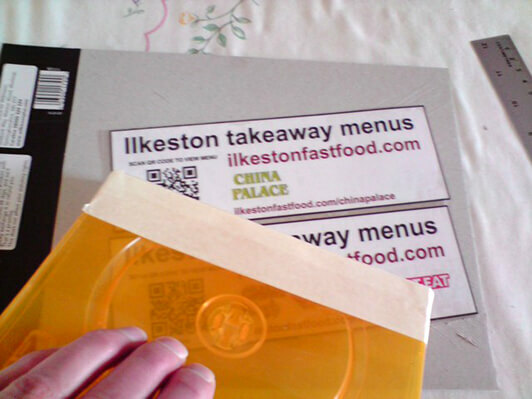 For my own purposes I sometimes use a DVD case with masking tape down one edge, or press down hard with a flexible plastic ruler. It makes the difference between a flat smoothed surface and a surface full of tiny bubbles, crinkles and creases. 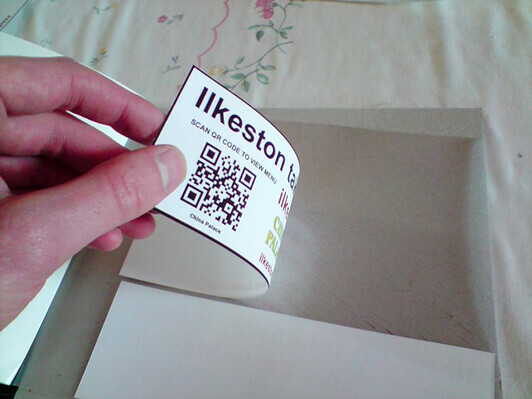 Anything you can find to press the laminated surface hard against the surface of the paper label will do. 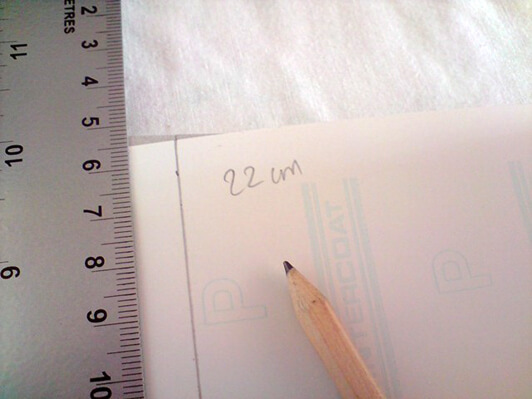 A flexible ruler together with a hard smoothing action on the surface makes a noticeable difference. 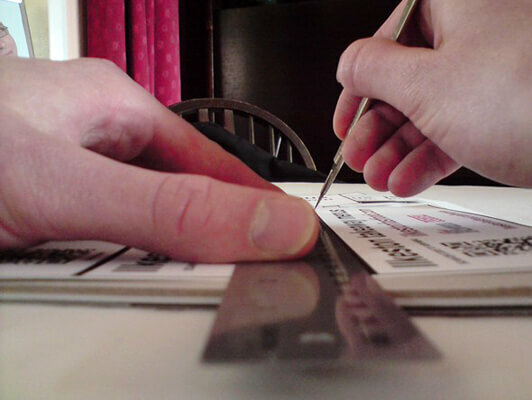 Your thumbnail can smooth the laminated surface against the paper. Apply even pressure to the entire label. Do you need your stickers to go onto glass facing outwards? Double sided clear adhesive comes with a wax paper which is simply peeled back and discarded, same as the previously shown laminating film. 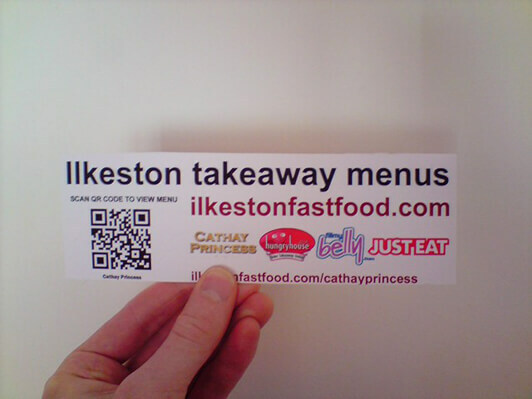 My own promo stickers have this on the front so they can be stuck to the glass inside the takeaway premises facing outward. People on the street can see and scan the QR code through the glass. Apply the double sided adhesive repeating the steps shown previously for the laminating film. Be careful where you place it because the adhesive is high tack. 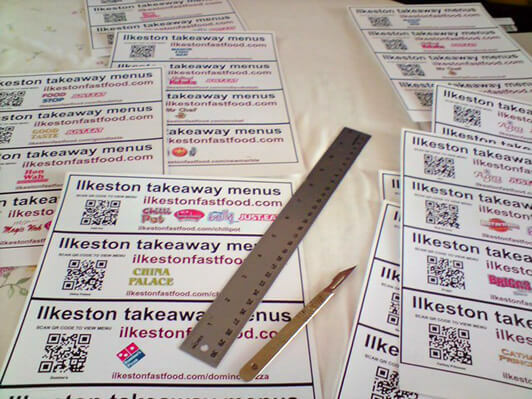 Ensure the surface is not dirty before choosing where to stick your QR code label. 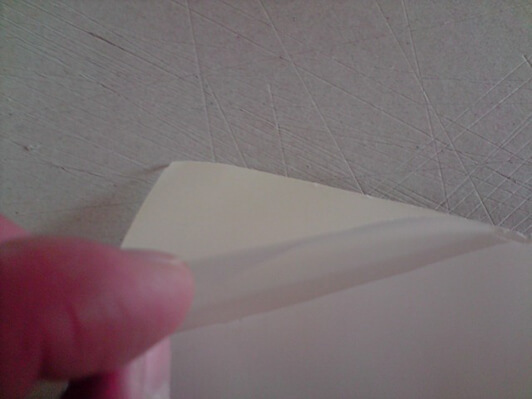 The waxy paper is peeled away to reveal the sticky clear adhesive. This is pressed against the inside of the shop window. Adobe Bridge is a must have product for quickly browsing and opening images. Keep costs low with test marketing. Get a good craft knife and sharp blades. I use a surgical knife which I’ve owned ten years! 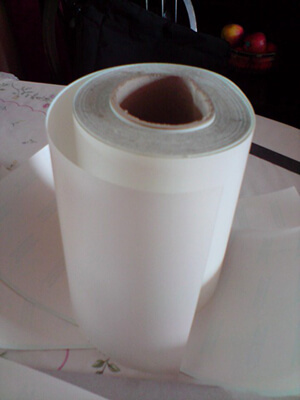 Rolls of adhesive or laminating film might be obtained for little to know cost.